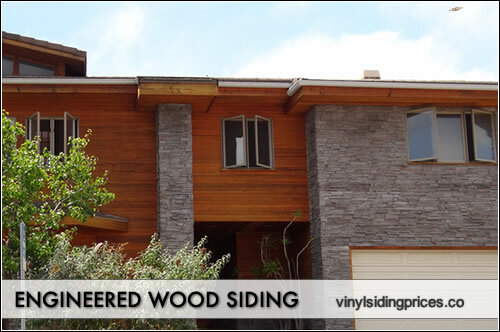 Engineered wood siding prices ranges from $3.50 to $8 per square foot installed. These products (such as LP Smartside, NuCedar or Collins TruWood) are becoming very popular because the panels look extremely similar to wood but do not require maintenance and are priced out only slightly higher than vinyl projects. Uninstalled engineered panels in the entry to mid range will, on average, cost $1.50 to $2.25 per square foot. Uninstalled engineered panels in the mid to high end range will, on average, cost $2.25 to $3 per square foot. All other materials needed for this project (which includes things like nails, housewrap, trim, fascia, soffit and trim) will run $1 to $2 per square foot. The overall price will be determined by the quality of the materials used and the extensiveness of their use. The installation and labor for most jobs that involve this material will be somewhat close to the cost of vinyl siding. These boards weigh about the same and fit together easily. They can be nailed onto the walls without too much additional labor. The installation price at the top end may be a touch higher than vinyl projects. Installed engineered panels in the entry to mid range will, on average, cost $3.50 to $6 per square foot. This cover the price for the panels, all other materials and the labor/installation on the project. Installed engineered panels in the mid to high end range will, on average, cost $6 to $8 per square foot. This cover the price for the panels, all other materials and the labor/installation on the project.